Serendipity struck for me this week, as both NPR (Kevin Bacon Plays Not My Job) and the card blogging world (Six Degrees of Ron Santo) referenced the Six Degrees of Kevin Bacon Game in less than 24 hours. Who am I to fight the invisible hand of destiny? 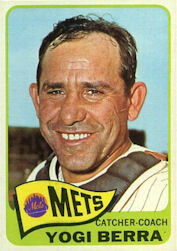 Six Degrees marked this week's D-Day Anniversary by connecting gunner's mate Yogi Berra to Ron Santo, starting with these 1965 player-coach cards. Topps used to feature coaches more than they do now, in part because fewer stars need to remain in the game for a paycheck. I'd forgotten Berra and Spahn both fit the bill in 1965, with Yogi playing his final four career games after coaching exclusively in 1964. 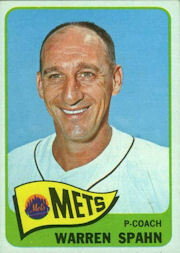 Spahn got more field work, going 4-12 in 19 starts, but was released mid-year and finished his MLB career with the San Francisco Giants. 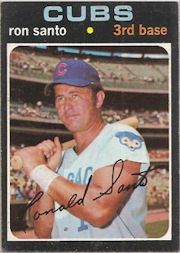 Check out Six Degrees of Ron Santo for more connections or to make a player request of your own! UPDATE: After hitting publish, what should I find but a third Kevin Bacon reference, courtesy of Seth Godin. You're welcome, nice work with your posting!